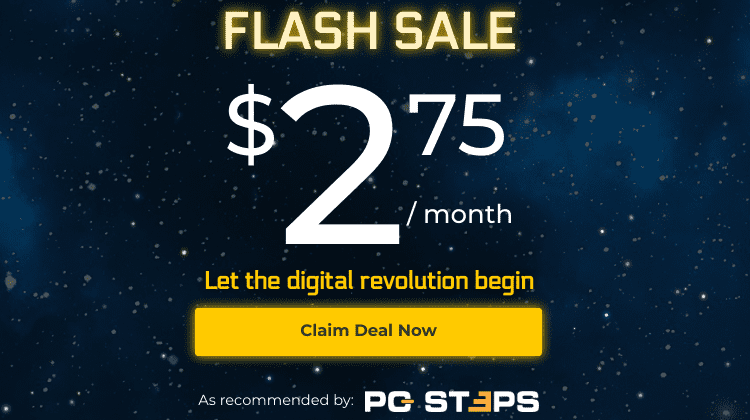 Have you upgraded from Windows 7/8.1 to Windows 10? Or from Windows 10 Creators Update to Windows 10 Fall Creators Update? 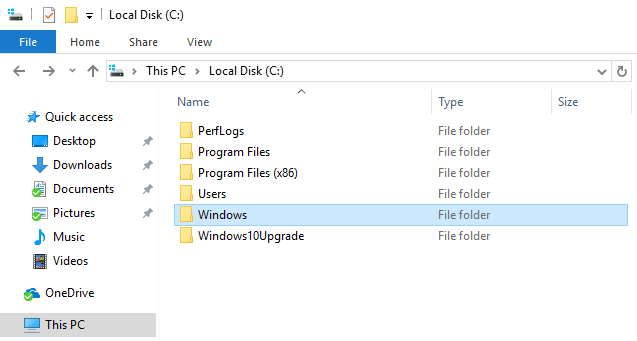 The upgrade process has created a Windows.old folder on local disk C:, which contains several gigabytes of data, and is impossible to delete with conventional methods. 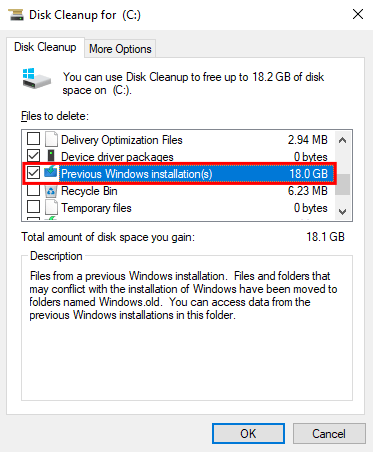 Here are all the ways to delete Windows.old and reclaim upwards of 17 gigabytes of space on our hard drive. Before you attempt to delete Windows.old on your system, it's always a good idea to create a full Windows backup, in case anything goes wrong. 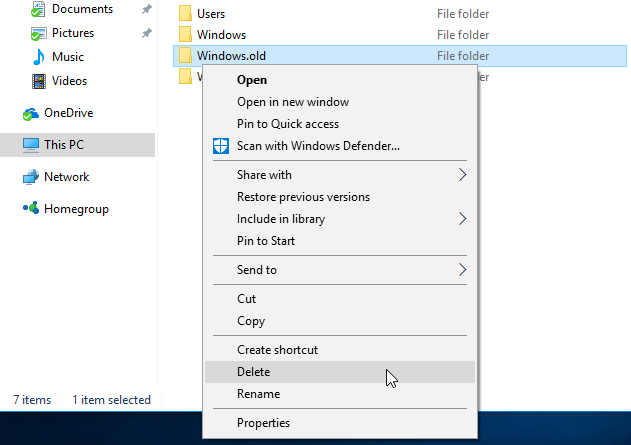 There is little risk in deleting Windows.old, but it's better to be on the safe side. Did you have any trouble to delete Windows.old? 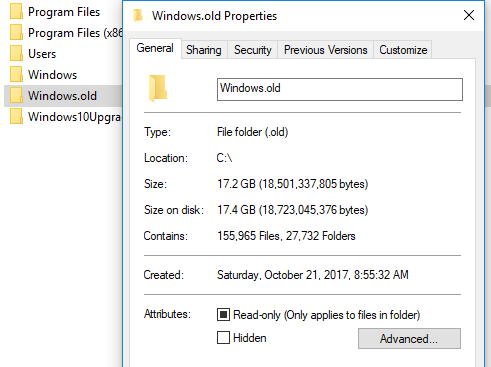 Windows.old isn't an essential system folder. It only appears at the root of the local disk C: if we did a complete Windows upgrade from an older version, instead of formatting the hard drive and doing a clean installation. The upgrade could be between entirely different Windows versions, such as from Windows Vista to Windows 7, or from Windows 7/8.1 to Windows 10. However, we will also get a Windows.old folder every time we upgrade between different versions of Windows 10, for example from the Anniversary Update to the Creators Update, and from the Creators Upgrade to the Fall Creators Upgrade. Inside Windows.old, we will find documents and folders from the previous installation. 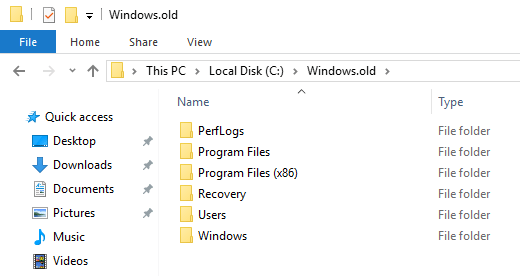 These include files from the PerfLogs, Program Files, Users, and Windows folders, among others. On Windows 7, the Windows.old is a "just in case" folder. The system doesn't use the old files in any way. It just keeps them, in case we need them. On Windows 8/8.1 and Windows 10, the contents of this folder are used to uninstall Windows 10 and revert to the previous operating system. On the recent Windows 10 builds, we have a 14-day period to roll back to the previous version. After the 14 days, the system will automatically delete Windows.old, or at least the part of it used for the rollback. In any case, Windows.old can be quite large. 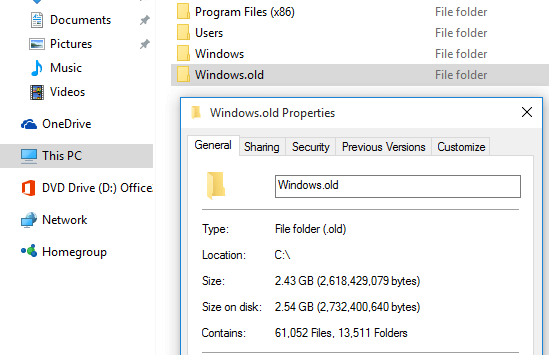 Small Windows.old folders start at more than 2GB. Depending on the previous installation, however, the Windows.old folder could be larger than 17 gigabytes. For a 120GB SSD, that's 14% of its capacity, then and there. ...we get a "You require permission from SYSTEM to make changes." 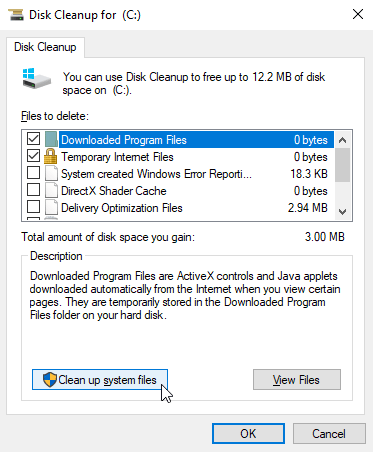 The official way to delete Windows.old is through Microsoft's integrated disk cleanup utility. 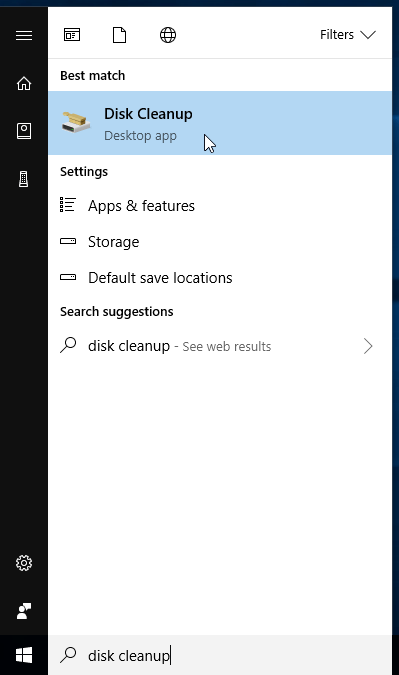 The fastest way to access Disk Cleanup on any version of Windows is through Windows search. There, we go to the "Clean up system files" option. The disk cleanup utility will reload. Among the options, we will find the "Previous Windows installation(s)." Checking it, clicking OK, and confirming our action will delete Windows.old. That's it. Windows.old is gone, never to be seen again. At least until the next Windows upgrade. 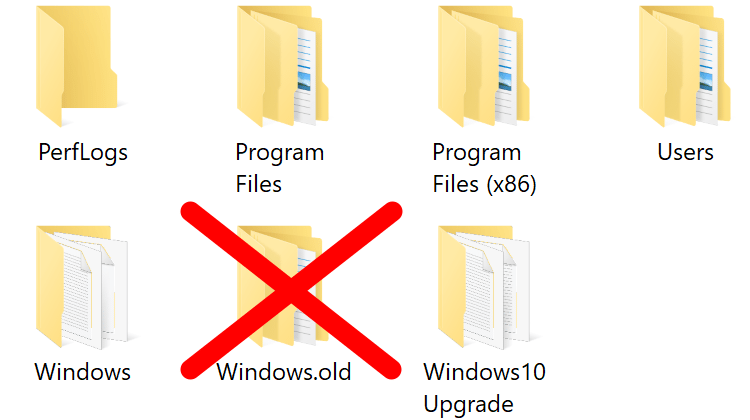 The Windows10Upgrade folder is also useless, but we can regularly delete it, the SYSTEM won't object to that (how nice of it!). We just confirm the administrator permission, and it's outta here. 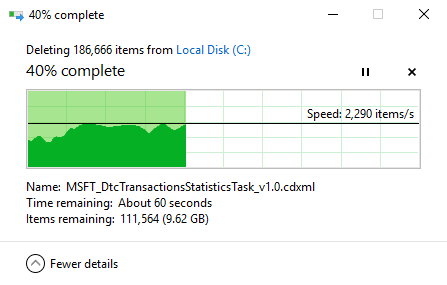 Disk cleanup is neat and fast. But, it is our PC, and we want to delete Windows.old our way, dammit! So, we will take control of this folder, delete it by hand, and stick it to the man. Because WE don't need "permission" from any SYSTEM. The SYSTEM needs permission from US. 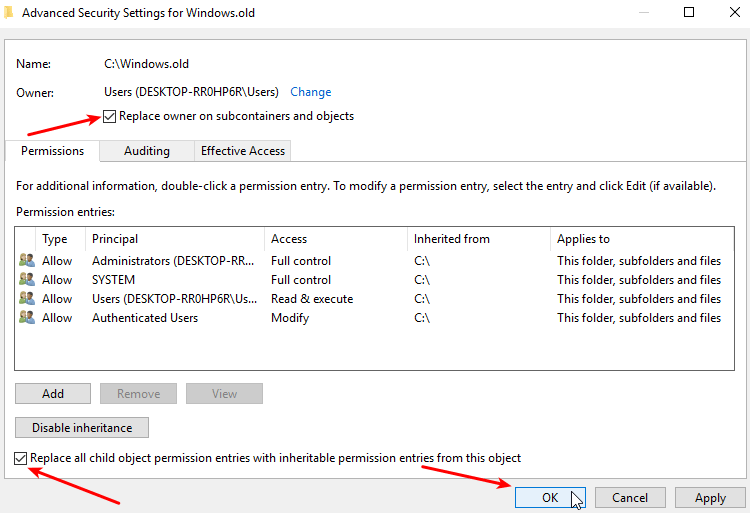 First off, we right-click the Windows.old folder, and select "Properties." 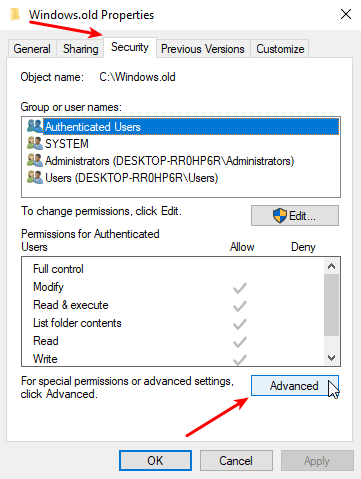 On the security tab, we select "Advanced." We click on "Change." Whistling the intro to the "Wind of change" is optional, but encouraged. 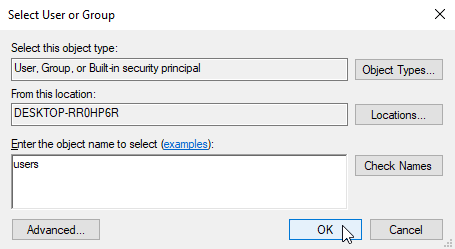 At the "Enter the object name to select" we type users, and click OK. This is how we give power to the people. Then, with the SYSTEM overthrown, we check both checkboxes and click OK. The SYSTEM asks us if we want full control. Hell yeah, we do, thank you very much. Depending on the number of files within Windows.old, the revolution will take a couple of seconds, a minute at most. Depending on the Windows version, the SYSTEM might try to change our minds. But a "yes" is a "yes." 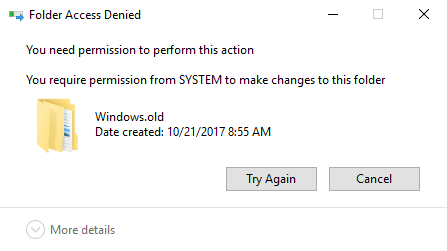 No SYSTEM permission needed. 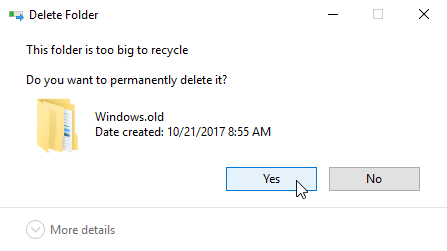 We tell the SYSTEM "Delete," and it says, "do you want to permanently delete this folder?" The process is much slower than through the disk cleanup utility. But more satisfactory, too. 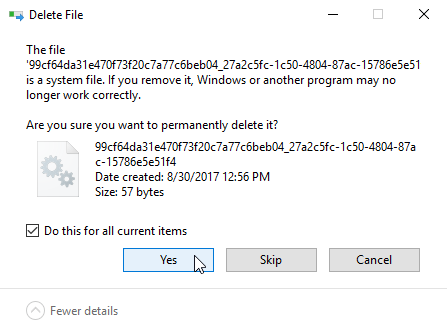 The SYSTEM might ask our permission to delete some system file or other. Just check "Do this for all current items." And that's how we delete Windows.old and show the SYSTEM who's Boss. If anything on this guide didn't work as described, and you weren't able to delete Windows.old on your PC, leave us a comment.